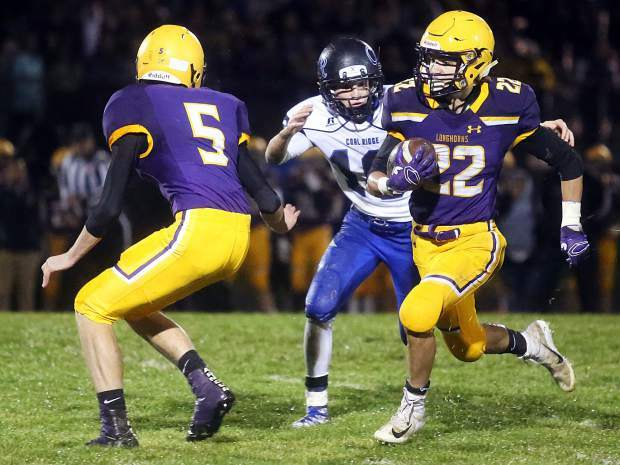 Basalt senior running back Jake Reardon carries the ball in the first half against Coal Ridge on Friday, Oct. 5, 2018 in Basalt. As difficult as it is to make the Class 2A playoffs in football, Delta High School finds itself backed against a wall. But, much like a wild animal, this could make the Panthers even more dangerous, and this is something Basalt understands. The Longhorns and the Panthers will meet at 7 p.m. tonight in Basalt with a whole lot on the line. No. 6 Basalt is a perfect 6-0 overall and 2-0 in WSL play. No. 10 Delta is 4-2 and 1-1, its league loss coming last week at No. 3 Rifle, 34-7. Basalt and Rifle are tied atop the WSL standings and are set to face either other next week, in Rifle, for what could be the de facto league championship game. The Bears first have to get by Aspen (4-2, 1-1) in Friday’s 7 p.m. game, also in Rifle. Coal Ridge (1-5, 0-2) and Moffat County (2-4, 0-2) are bringing up the rear of the league right now. They also play Friday night. Like Rifle, Delta is a newcomer to the 2A WSL this season. Basalt and Delta played each of the past two seasons, BHS losing 42-7 two years ago in Delta before winning 35-7 last fall in Basalt. However, both of those games were non-league and early season, giving this year’s matchup a much different feeling. Basalt enters tonight’s game riding its dominant defense, which has four shutouts in six games, including last week’s 34-0 homecoming rout of Coal Ridge. The Longhorns have only allowed 19 points this season. Under longtime coach Ben Johnson, Delta continues to run a version of its vaunted wing-T offense. Sophomore quarterback Nolan Bynum has proven to be a solid passer, throwing for 707 yards with nine touchdowns and only a single interception. Junior Cody Suave does most of the running, as he has a team-high 432 yards on the ground. While the stars are aligning for Basalt and Rifle to tango for the league title, both Delta and Aspen could play spoiler. The Skiers lead the league in points — 239 on the season — although they face a Rifle team tonight that is just behind them with 230 points. The biggest difference is defense, with Aspen having allowed 130 points on the season and Rifle only 50, which is second in the league to only Basalt. Should the Skiers pull the upset over Rifle and stay in the WSL race, Aspen would have Coal Ridge for homecoming next week and a trip to Basalt in the regular-season finale to go. In the all-important RPI, which determines postseason seeding, Basalt is No. 1 in 2A this week, Rifle is No. 5, Delta is No. 9 and Aspen is No. 14.